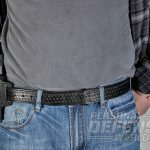 Hitch your holsters to these high-quality belts for everyday concealed carry! 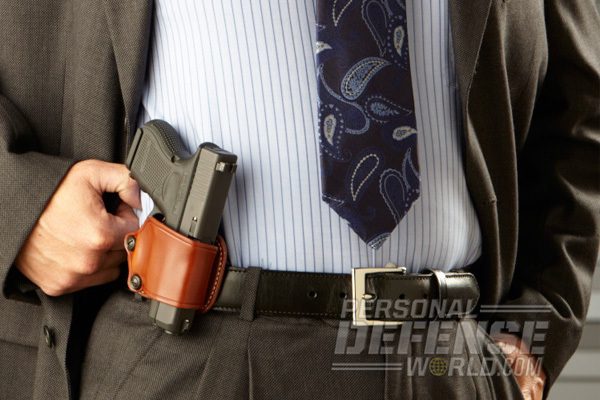 The belt is an oft-overlooked component of the concealed-carry system. 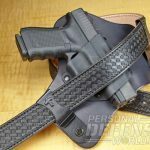 Many folks will go out and spend big bucks on a quality handgun and holster only to hang this world-beating combination on a cheap department-store belt. But cutting corners here can lead to all sorts of unintended consequences. 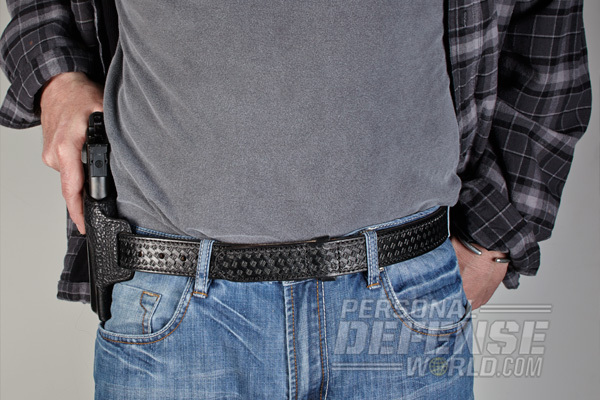 Off-the-rack belts are fine for holding up your pants, but they come up short for the armed professional or responsible citizen carrying a handgun. 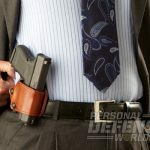 When a holstered pistol is worn on an inferior belt, it often pulls away from the body and becomes clearly visible under all but the heaviest clothes. 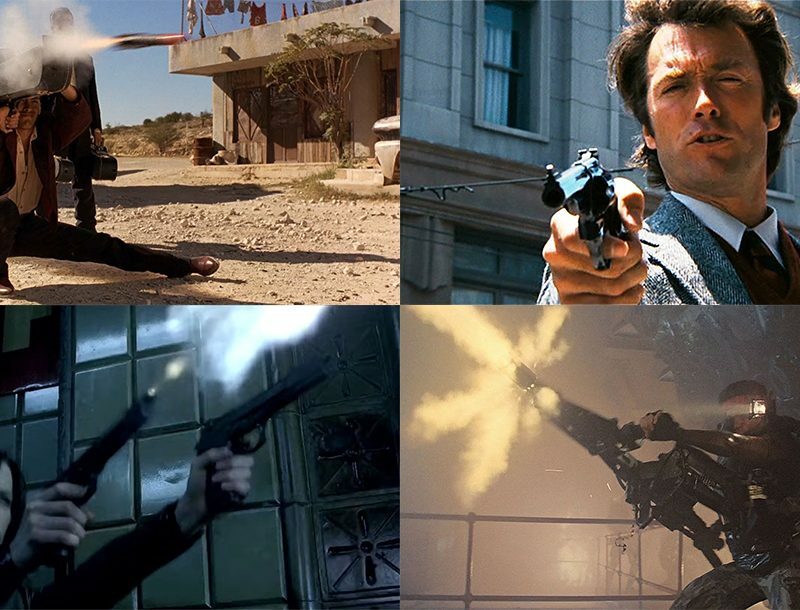 And when you draw the pistol, the belt often moves with the holster, delaying your response time. 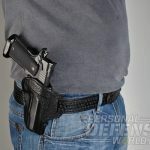 The belt remains the foundation of the concealed-carry system: Both concealment and draw times are enhanced by the right choice. 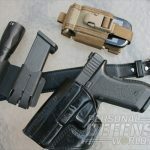 A good place to start your search is with those firms that market quality concealment holsters, as they have a keen understanding of what works. 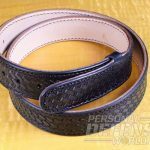 Over the years I have had very good luck with belts from Milt Sparks, Mitch Rosen and Pocket Concealment Systems. 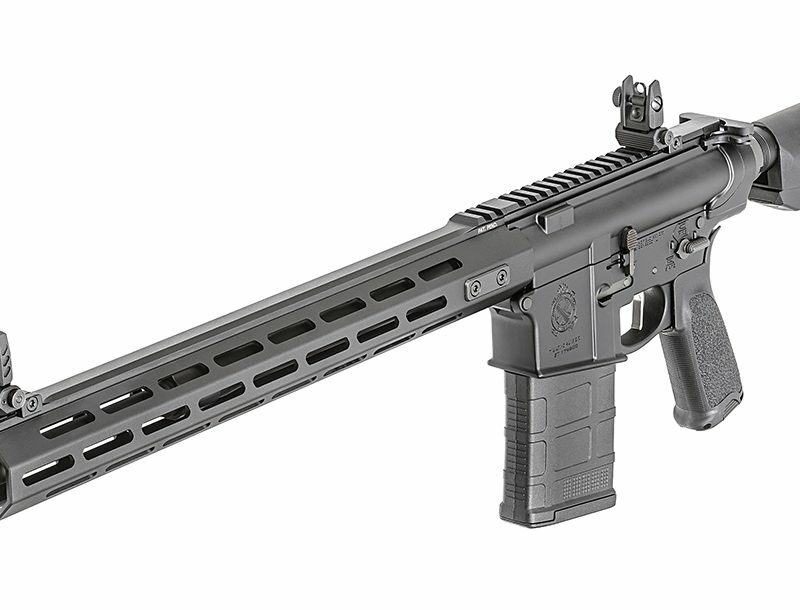 I recently expanded my horizons and evaluated some offerings from other manufacturers. Let’s see how they stacked up. 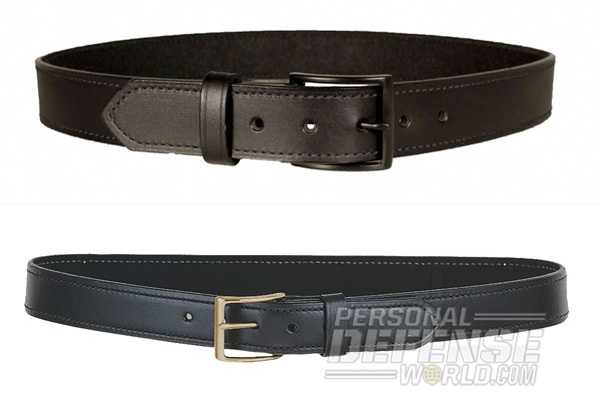 In my opinion, gun belts fall into one of two categories. 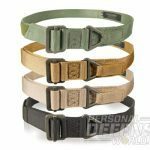 The first consists of tactical or sport-type belts normally associated with firearms or other outdoor activities. The second consists of classic designs that look good in public settings, ones where you don’t want to look like someone who’s carrying a gun. 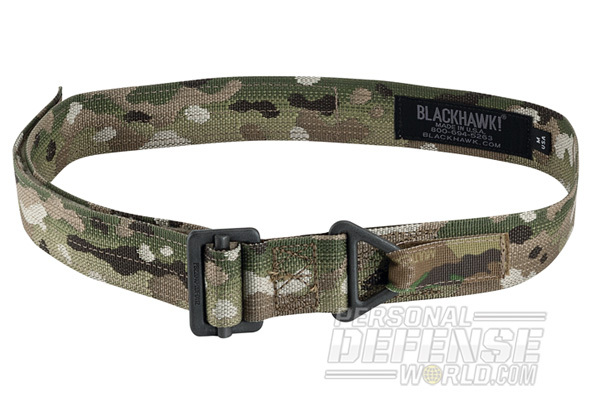 The BlackHawk Instructors Gun Belt neatly fits into our first category. 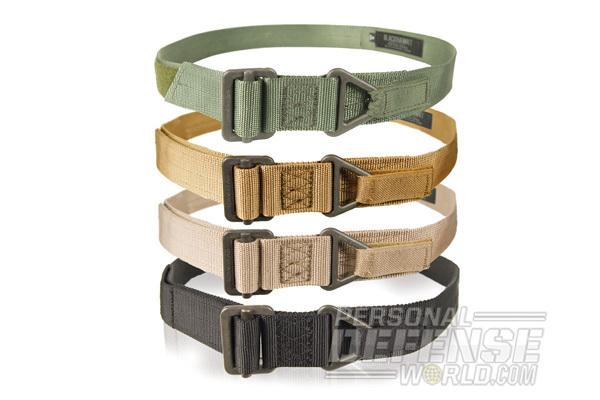 The Instructors Gun Belt is crafted from 1.75-inch-wide webbing that has a 7,000-pound tensile-strength rating. A Kydex stiffener is sandwiched inside the belt to help support the pistol. 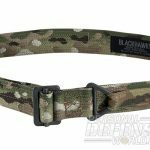 To keep things secure, BlackHawk uses a parachute-grade buckle and adapter plus a hook-and-loop fastener on the running end. 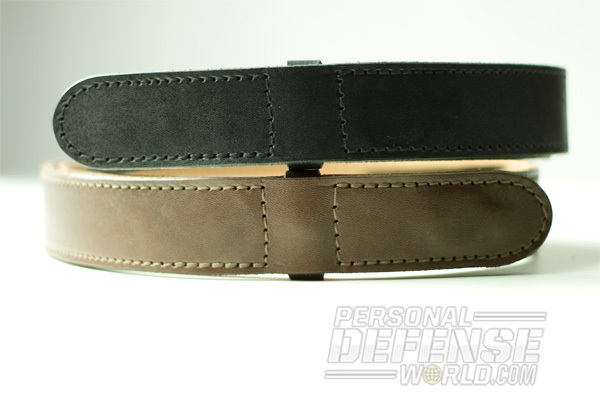 The Instructors Gun Belt looks a bit “gunny” and may not be the best choice for around-town wear. 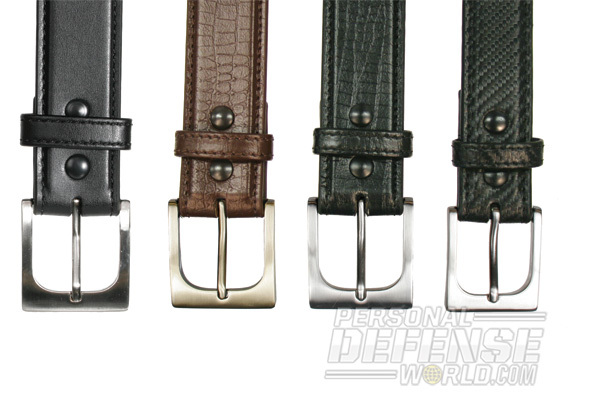 But, on the range or under a covering garment, the Instructors Gun Belt will support your gear in fine style. 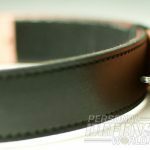 Amerihide’s line of belts are handcrafted in the United States to your specifications. Featuring high-quality leather, they are glued and stitched together with nylon thread for strength and durability. 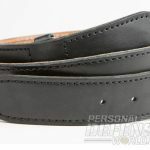 The belts are offered in widths of 1.25, 1.5 and 1.75 inches, and are approximately 0.25 inches thick. They are available in black or brown, with several patterns offered. 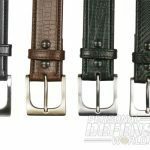 Hardware on the belts includes chrome or brass Chicago screws and heavy-duty stainless steel Any-Day Belt Roller Buckle or Any-Day Belt Chrome or Brass Square Buckle. 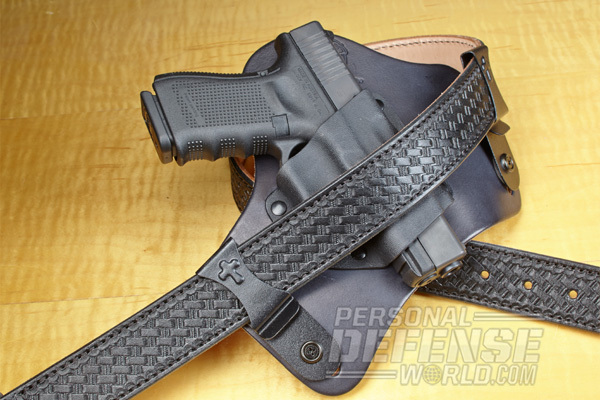 Gene DeSantis (CLICK HERE to see Video of DeSantis Holster’s 40th Anniversary – Interview with Gene DeSantis) has long been offering quality concealment holsters at very reasonable prices, and his company’s line of belts are a continuation of the tradition. 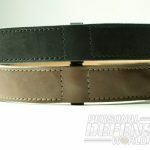 The DeSantis 1.5-inch-wide Plain Lined Belt I tested was tan in color and sported a brass buckle. (This same design is also available in black with a nickel buckle.) Variations can be had in 1.25- or 1.75-inch-wide models and with decorative stitching. 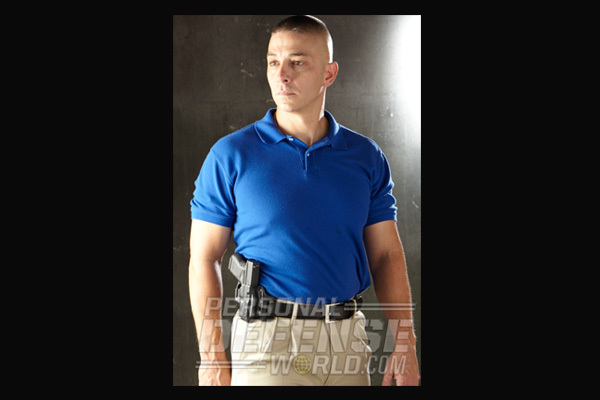 I used the DeSantis Plain Lined Belt with a Glock 19 pistol, and as expected, all went well. 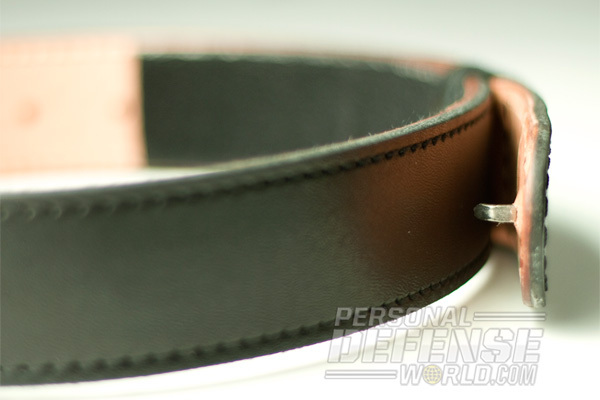 The inner suede lining keeps the belt from moving about on the pants, which speeds up draw times. 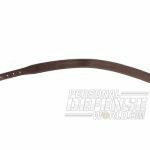 A lined DeSantis Econobelt model crafted from bonded leather is also available—and it, too, hit the spot. 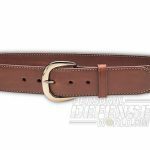 CrossBreed is perhaps best known for its very comfortable SuperTuck holster, but they also turn out some top-notch belts. 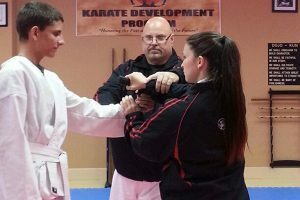 For something a little different, I took a look at the company’s new Instructor Belt. 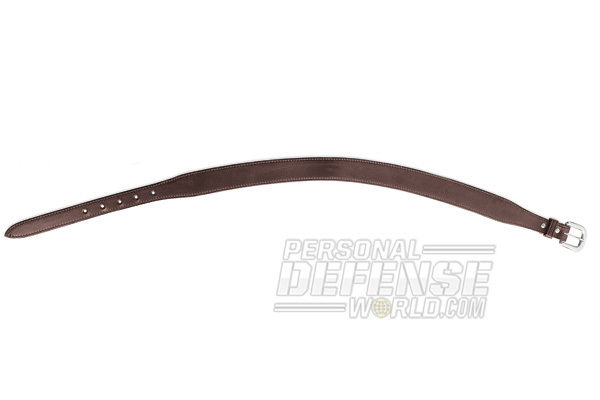 The CrossBreed Instructor Belt is a buckleless design made of two layers of top-grain cowhide. The layers are stitched together, cross-grain from each other, using recessed stitching for protection against surface abrasions. My finished belt was 1.5 inches wide and just under 0.25 inches thick. 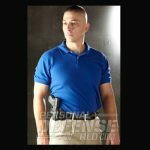 For users who prefer total concealment, CrossBreed sells a Velcro-Kit to better camouflage your pistol under a tucked shirt. 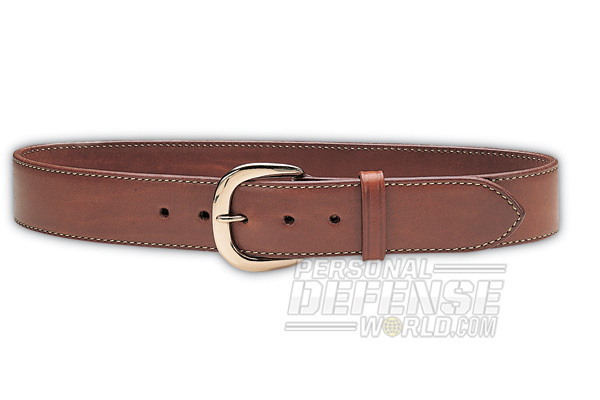 Galco’s Concealable Contour Belt is just the ticket for going armed in polite society. This 1.5-inch-wide belt tapers in the front, down to 1 inch. To the casual observer, it looks very much like a high-end dress belt. This belt is rendered from premium saddle leather, and the nickel-plated, solid-brass buckle is another classy touch. Without question, the belt’s rounded contour enhances user comfort over the course of a long day. Throughout my evaluation, both gun and magazine pouch stayed put, and draw times were very fast. For consumers who prefer a wider belt, there’s the Galco Sport Belt, also crafted from premium saddle leather. My copy is 1.75 inches wide and includes a solid-brass buckle. 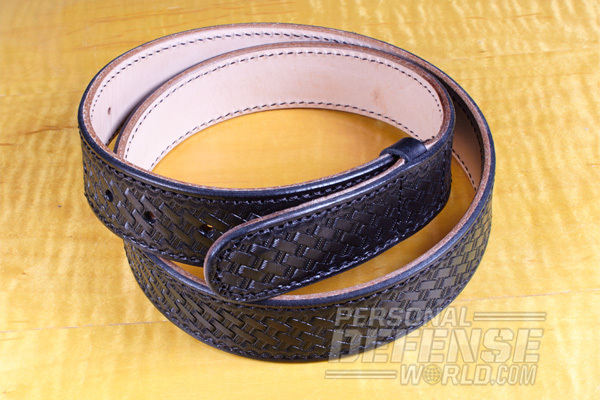 The Galco Sport Belt is also available in a 1.5-inch-wide version or with decorative stitching. Mine proved the ideal mate for my heavy 4-inch, N-Frame revolvers. I work as a law enforcement trainer a few days a week, about all of which I spend on the range. 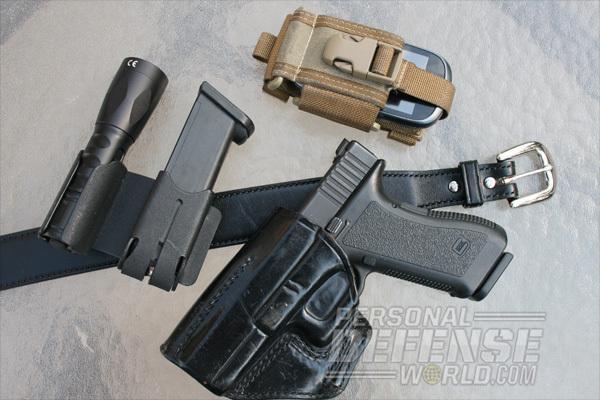 A service-size handgun, spare magazines and flashlight are part of my everyday gear, and I need a heavy-duty belt to accommodate them. 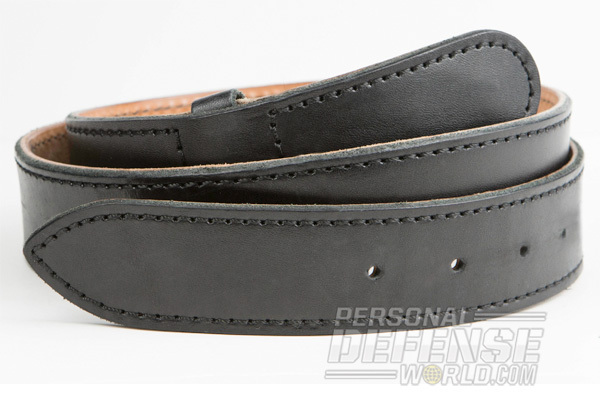 Of late, I have been utilizing a Galco Instructors Belt reinforced with a 1.75-inch width. Made of type-B nylon webbing, it has a polyurethane reinforcement insert for maximum rigidity. It also includes a drop-forged parachute-spec buckle finished in Robar’s excellent corrosion-resistant Roguard. 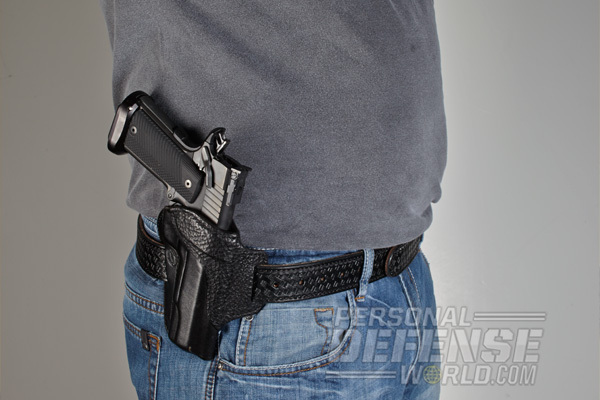 Though a gun belt may seem insignificant compared to a handgun or holster, it is a cornerstone of concealed carry. Be sure to give the subject some thought before strapping on your pistol.